Enitan Ogunwusi, Ojaja II has said africa continents remained one united big family working together for the progress of the African continent despite boundries in our countries and communities. 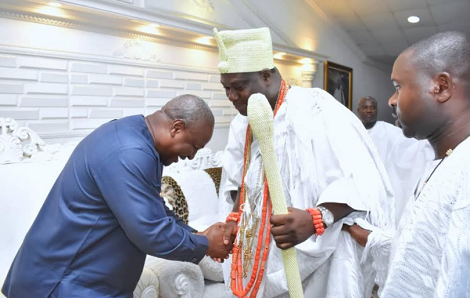 The African foremost monarch said this on Thursday at his Ile-Oodua palace in Ile Ife while playing host to the immediate past President of Ghana, Mr. John Mahama who led his team on a courtesy visit to the Ooni. "Before the advent of the Western civilization, there were no boundaries between the African nations and communities We are one big family"
"But it gladdens my heart that with committed individuals like President Mahama, we have remained that united big family working together for the progress of the African continent." 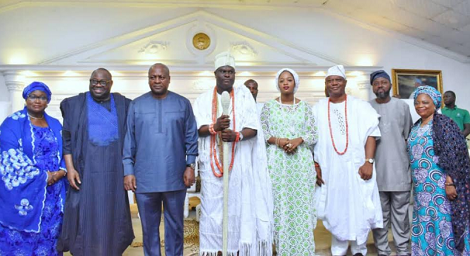 Accompanied by his beautiful queen, Olori Silekuola Naomi Ogunwusi, Ooni Ogunwusi who is a Co-Chairman of Nitional Council of Traditional Rulers of Nigeria prayed for the former President, also called on the Isoros (Custodians of the 201 dieties of Ile Ife Kingdom), who jointly offered spiritual blessings to former President Mahama, lauding the former president for exhibiting humble and simplicity character. "When I was in Ghana to honour Mr. President two years ago, he was in power, to the glory of God, he displayed humility and simplicity. 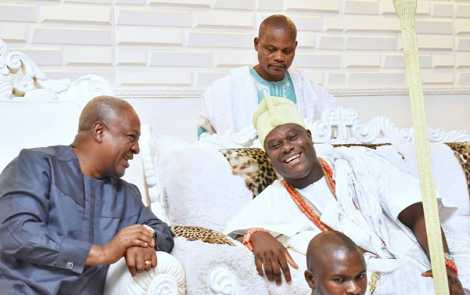 Earlier on his speech, President Mahama thanked Ooni for the warm reception, describing the Ife kingdom as the root of the rich African culture. "I am overwhelmed by the welcome I got and the current atmosphere since I stepped out of the car. The drums, dance, songs, dressing and others are indeed wonderful." "As a student of history, I have read and studied that Ile-Ife kingdom as the cradle of human race, and the kingdom occupies a high position in the global history." "I have come to return His Imperial Majesty's visit to the Republic of Ghana two years ago, especially to encourage him in his efforts of unifying the African continent. I'm impressed, and I appreciate everything done in my honour." 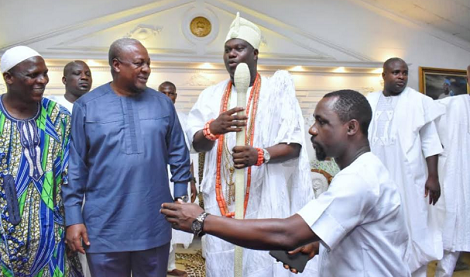 It will be recalled that the visiting former president of Ghana had once played a host to Ooni Ogunwusi and entourage while the African foremost was on a 5-day working visit to Ghana in 2016. The former Ghanaian leader was accompanied by his elder sister Alhaja Sherifat Dundu and her husband Alhaji Bisi Dundu. Others are Chief Of Staff to the former president, Mr Julius Debra, Alhaja Olusola Shodeinde, Professor Jeleel Ojuade of University of Ilorin and Bashorun Dele Momodu, Publisher, Ovation Magazine.